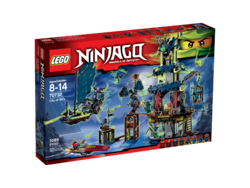 70732 City of Stiix is a Ninjago set released in 2015. This is a description taken from LEGO.com. Please do not modify it. (visit this item's product page) Seek out the Scroll of Airjitzu in the City of Stiix! Team up with the Ninja as they battle to enter the spooky City of Stiix! Power towards the city on Nya’s speedboat, blasting the stud shooters at the ghoulish enemy. Evade shots from the city’s rooftop ghost bomb shooter, outpost cannon and the massive Ghost ship’s stud shooters to reach the dock. Battle against the Scythe Master Ghoultar with Jay’s powerful Deepstone Katana. If a Ninja gets captured in the prison cage, use Nya’s crowbar to break them out. Find and open the secret entrance to the temple, but watch out for the trap door on the first floor. When you reach the top of the city, battle the Evil Green Ninja and seize the Scroll of Airjitzu! 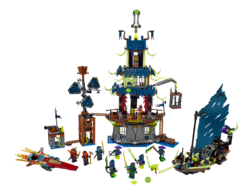 Includes 8 minifigures with assorted weapon and accessory elements: Kai, Jay, Nya, Evil Green Ninja, Chain Master Wrayth, Scythe Master Ghoultar, Ghost Warrior Cyrus and Ghost Ninja Ming. Don’t fall through the temple’s trap door! Facts about "70732 City of Stiix"
This page was last edited on 9 February 2019, at 21:36.